Norfolk, Va., Puts Flooding Survival Plan To The Test The city has spent many years studying how to survive flooding in an era of rising sea levels. The centerpiece of its survival strategy is a comprehensive plan to keep water out of some of the most vulnerable neighborhoods. If you drive through the communities surrounding Norfolk, it's easy to see why many people still call this area Tidewater. Go east to Virginia Beach and you hit water. Go west to Lambert's Point or north to Ocean View and there's more water. And in downtown Norfolk, the water is so close that a moored battleship, the USS Wisconsin, looks like it's about to enter rush hour traffic. So when residents here got news of Sandy's impact up north, they felt compassion, says Norfolk Mayor Paul Fraim. But they also felt another emotion, he says. "I think we were all relieved that it wasn't us," he says. "It could have been us." About 1.7 million people live in this area, which includes a major port and is home to the world's largest naval base. All it takes is a high tide or heavy rain to cause problems, Fraim says. "We deal with stormwater flooding in the city now on a monthly basis," he says. "And we talk about planning for it, mitigating, all the time." The city doesn't have much choice. Fraim says Sandy turned city streets into rivers, even though it was just a Category 1 storm that passed by well out to sea. "A severe Category 2 or a Category 3 storm, if we were to receive a direct hit, almost all of the city would be underwater," Fraim says. That's true even though Norfolk has already done a lot to protect itself. Larry Atkinson, an oceanographer at Old Dominion University, likes to show visitors the massive sea wall that usually keeps water out of Norfolk's downtown. "That's it," he says, standing on a platform just outside the sea wall. "There's piles of rock about, what, 10, 20 feet high, and it runs into a concrete wall." The sea wall was high enough when it was built several decades ago, but Atkinson says it may not be anymore. "Well, you can see the brown mark there on the pumping station," he says, pointing to a place well up the wall. "That's where high tide normally is." When Hurricane Irene went by last year, waves approached the top of the barrier, Atkinson says, adding that just about everyone in Norfolk acknowledges the problem of rising water. "The debate here is: What do you do?" he says. "There's no longer the question about what's going on. We know what's going on." 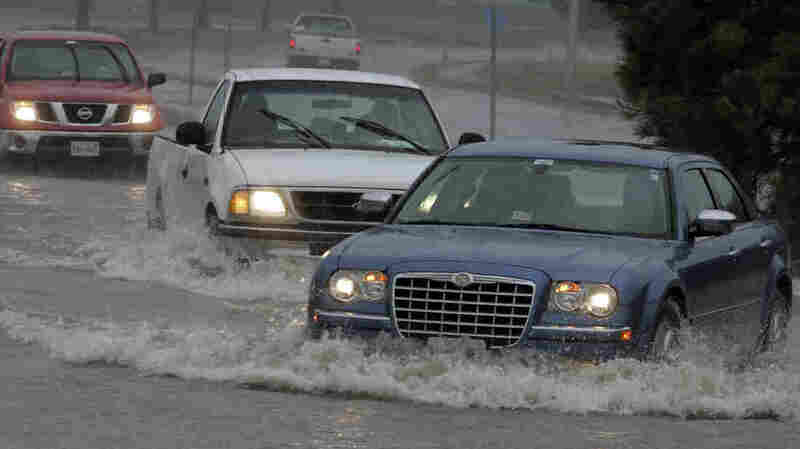 There are several factors that make Norfolk highly prone to flooding. First, for a variety of reasons, the land here is sinking. Second, sea level everywhere is rising as warmer temperatures melt polar ice and cause ocean water to expand. Then there's a third factor that scientists confirmed just a few months ago: This stretch of the Atlantic coast is getting an extra dose of sea level rise. The reason is that the extra water in the oceans isn't being distributed evenly, says Asbury Sallenger of the U.S. Geological Survey. "We should not view sea level rise as like a bathtub just filling up with water," he says. That's because, unlike a bathtub, the ocean has currents that pile up water in some places and keep it low in others. Imagine you have a cup of water, Sallenger says. "If you take a spoon and you stir, you'll see that the water rises along the margins of the cup," he says. "And that elevation will stay higher as long as you keep stirring." When you stop, though, the water at the margins falls, while the water in the center rises. And that's what's happening now because global warming is slowing some currents in the Atlantic, Sallenger says. "So places like New York City and Norfolk, Va., will have significantly higher sea level rise rates than places farther south along the Eastern Seaboard," he says, adding that the higher rate could mean an extra foot or so of water by the end of the century. People in Norfolk are aware of the growing flood risk, but aren't necessarily doing anything about it, says Poornima Madhavan, who is in the psychology department at Old Dominion University and has done surveys of how people are responding. For example, the proportion of people who said they had flood insurance was "a completely underwhelming 1 percent of the population," Madhavan says. Surveys also suggest that longtime residents expect to stay, even if the flooding gets worse, while many other people say they'll just move away if flooding gets too bad, she says. And that could be a big problem for places like NASA's Langley Research Center, she says, which has protected its runways from flooding, but can't protect the homes of its 4,000 workers. "And then we have the shipyard on the other side of the Peninsula, which has been seeing water in its dry docks," Madhavan says. "They employ 25,000 or 30,000 people. They're going to have to go somewhere." To make sure residents don't lose their homes, Norfolk has already taken a number of steps. It spends millions each year to improve drainage. It has also raised the level of some roads and found money to elevate the foundations of some houses. But the centerpiece of Norfolk's survival strategy is a comprehensive plan put together by a Dutch company to keep water out of some of the city's most vulnerable neighborhoods. The plan includes more sea walls, floodgates, pumping stations and earthen berms. The price tag: about $1 billion, roughly the size of the city's entire annual budget. That means it can't be done without help from state and federal government, Fraim says. "We simply are not able to hold back the sea by ourselves." And even if Fraim is able to raise the money, the city's strategy will still require something known as "managed retreat," he says. "The cost of the flood mitigation sometimes is so steep that it actually makes more sense just to, you know, give up a few homes," he says.